Girls in Gis is a trailblazer for women’s events and has inspired may to do the same since it’s start in 2009. The name has become a household brand and the organization has become internationally recognized. This is largely because the foundation for Girls in Gis was strong from the start, the purpose was clear and has never strayed from the mission. However, the true secret to success are those that dedicate their time, energy and resources to further the growth and serve the community. Without the support of the entire community and the hard work of the girls that work behind the scenes it would not have the widespread success we see today. The programs are designed to bring together the entire community, to inspire females and encourage them in their BJJ journeys. The message of love and unity is not something the girls of Girls in Gis preach, but something they practice too. With in the organization you will find that every ambassador is from a different academy, different backgrounds, but they all have the same purpose and are exceptional ambassadors for Girls in Gis on and of the mats. The coming together of females from all academies to support each other and build a sisterhood extends to our team as well to each and everyone that is a part of the community. The impact of Girls in Gis has been huge and the mission has been clear, but the question remains, who are the girls behind Girls in Gis? Lana Hunter, a brown belt of Ohana Academy, has been an integral part of Girls in Gis (GIG) and it’s growth. She began her Brazilian Jiu-Jitsu (BJJ) journey eight years ago. When she isn’t wearing a gi she is a psychologist for the geriatric population. Most of her days in nursing homes with the elderly helping them cope with various problems like depression, anxiety, and end of life issues. She originally started training because she was interested in Mixed Martial Arts (MMA). 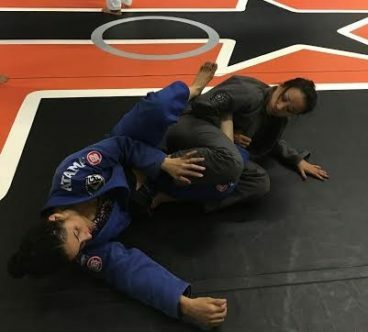 She says she quickly fell in love with BJJ and gave up the idea of MMA pretty early and became very involved with training and competing in BJJ. Almost seven years ago Lana was cruising the internet and found a group called Girls in Gis on Facebook for girls to connect and get together to train. She said that was the moment she decided she wanted to train with more women and attended the very next event. At the time, GIG was a small group but Lana remembers having a lot of fun meeting and rolling with other women who were just as passionate about BJJ as she was. This was a first for Lana. It wasn’t long before Lana was driving all across Texas to every GIG event she could get to. It wasn’t long before more women were doing the same with her, including Shama Ko. According to Lana GIG has definitely strengthened the bond between BJJ women all over Texas. Women newer to BJJ get to meet higher ranking women. Higher ranking women have an opportunity to train with each other and help encourage new women. After attending countless events, Lana decided she wanted to do more and get involved. Her motivation to get involved was because she wanted to be help increase the number of women training and spread the BJJ love. She saw the infinite potential that Girls in Gis posses in spreading that love. 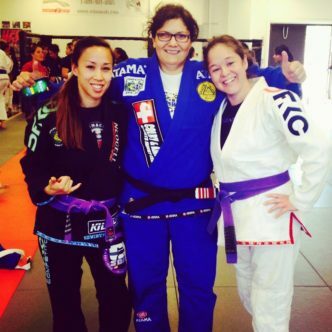 Girls in Gis has broaden and widened her bond with other BJJ women, not just in Texas but through all the states she has helped to facilitate events in. Since her start Girls in Gis has come a long way from that small group it started out as. Lana has assisted in this growth not only in Central and Southern Texas, but in Colorado, Oklahoma, Nevada, Arizona, Louisiana, Florida and Hawaii. She is one of Girls in Gis most experienced ambassadors and her work helping to spread the love is far from over. that tea is my favorite! and i'm glad your school year is off to a good start. once my students got to me, i reeembmred why i love teaching so much! hope you have a great weekend!